No matter where you are in the world, you are welcome to enter and experience the piece . Baggage Allowance is a sonically and visually layered intermedia work developed by Pamela Z in three interconnected components– a solo multi-media performance, a gallery installation, and an interactive web portal – all with shared content and materials. Through vocal performance with electronic processing, found text, and recorded interviews, multi-channel sound, interactive video, and sculptural objects, Baggage Allowance scans and inventories the belongings (and memories) we all cart around. The work explores the concept of baggage in its many senses – physical, intellectual, and emotional – baggage as impediment and baggage as treasure. Drawing from Ms. Z’s extensive traveling and cartage experiences, text from found sources, and interviews with travelers who speak poetically about their memories of train travel and flying and their numerous baggage-related stories, the work features episodes that touch upon the ball-and-chain-ness of dragging one’s things all over the world. The installation consists of multiple audio, video, and sculptural elements including a weeping steamer trunk, a mock X-ray machine that reveals secrets when bags pass through it, and a vintage suitcase inside of which lies a woman sleeping and worrying. The solo performance includes a series of vignettes and episodes relating to the cartage and attachment performed with live voice, electronic processing, and interactive video. All the versions of this work explore the concept of baggage in its many senses– physical, intellectual, and emotional – baggage as impediment and baggage as treasure. "As a touring artist working with technology, I spend a substantial portion of my days carting a curious and ever-changing collection of objects around the world with me. I’ve become a nomadic creature, always needing to have certain possessions at the ready – and always in some stage of packing or unpacking. I have amassed countless stories and an interesting perspective on the subject of baggage, and the experience has lead to a lot of self-examination and general curiosity about the attachment we develop for things we feel the need to keep with us." The performance of Baggage Allowance had a bi-coastal premiere. The world premiere was at Z Space @ Theater Artaud, San Francisco in May 2010 and the New York premiere at The Kitchen in September 2010. Scored for voice with electronic processing, found text, fragments of recorded interviews, sampled sounds triggered via a gesture-activated MIDI controller, and multiple channels of interactive video, Baggage Allowance takes place on a set of non-conventional projection surfaces, and found props including antique luggage and vintage technology. Excerpts from the video documentation of the performance can be viewed here. 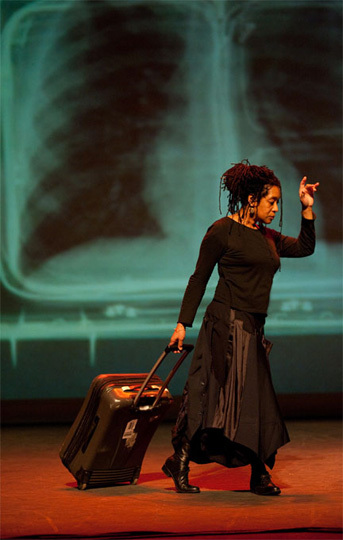 For information about booking a performance of Baggage Allowance, contact Pamela Z Productions. The Baggage Allowance installation was presented in a solo exhibition at the Krannert Art Museum in Champaign, Illinois January - April 2010. Some of the pieces from the exhibition were also shown in the lobbies of the venues where the performance took place. The exhibition consists of seven mixed-media works involving sculptural elements embedded with audio, video, and interactive software, including a weeping steamer trunk, a mock X-ray machine that reveals secrets when bags pass through it, and a vintage suitcase inside of which lies a woman sleeping and worrying. A video overview of the media works in the installation can be viewed via here. 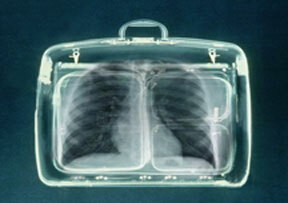 The Baggage Allowance Web Portal is an online art work – a web-based version of the intermedia work Baggage Allowance. Designed specifically for the web medium, this piece contains muliple layers of content arranged in a series of spaces where the viewer can enter and explore. The Baggage Allowance web portal had its official launch on July 28, 2011 and will remain active indefinitely. It can be found at baggageallowance.tv . Bay Area Video Coalition (BAVC) on July 28, 2011 from 6pm to 8pm. Be nosey. Thoroughly inspect every bag and open every trunk drawer. Take your time. (Smart security takes time.) You will uncover more if you linger. And you'll increase the thrill of possibly getting caught. Make sure your audio is on. The promotional trailer for the New York performance at the Kitchen can be found here. Baggage Allowance was made possible in part by grants from the Creative Work Fund, Multi-Arts Production Fund (MAP), and the American Composers Forum Subito program. Pamela Z produced Baggage Allowance in collaboration with Bay Area Video Coalition.